"Some of the pictures were at Hickam AFB. I can't remember where the others were taken. All on the Oahu Island. The woman in the car is my wife Marian along with three of our children. Quite cozy. 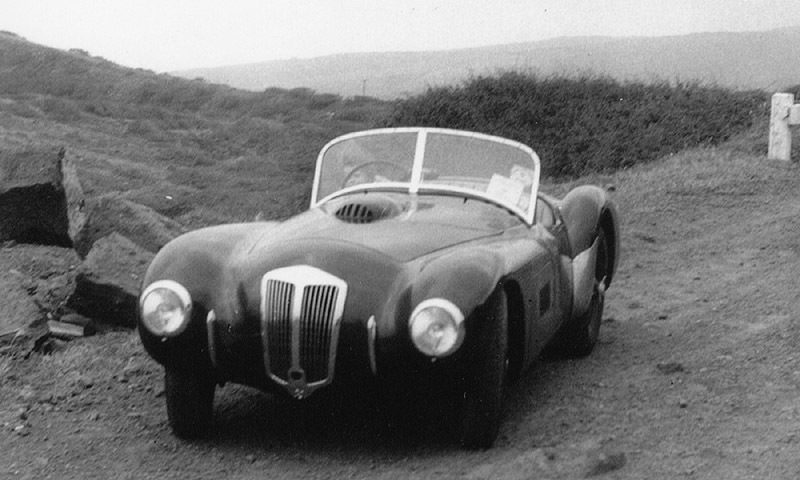 I am still disappointed that the individual that restored the Cad-Allard which I owned never kept his word about keeping in contact so I could view the final restoration. It's possible there was too much to do and he dropped the project. Anyway I hope your final results on the FN will be outstanding." "Finally located some snapshots of the Frazer Nash. The tires you can see in some of the pictures were the ones on when I drove it from New York to Florida and back to Philadelphia, and were on the car when I sold it in Honolulu. The reason I mention it because they were so different from the ones in the picture you sent me. I drove the family around the island, as you see in the snapshots. Really quite comfortable...never did consider seat belts. 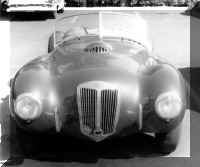 Alas, I cannot find any shots of the LeMans Replica (S/N 421/100/160, engine FNS 1/37, 1952 Sebring winner) and have not found any more information on its location. It is possible that Perry Boswell, Jr. - last heard of in Stewart, Florida - might recall who his father sold the car to. I guess anyone with time and money could so a search at the license bureau in Florida because I am pretty sure that is where Perry Sr. sold it or traded for another car." "I went through this same situation with the Cad-Allard I had. I really enjoyed that. 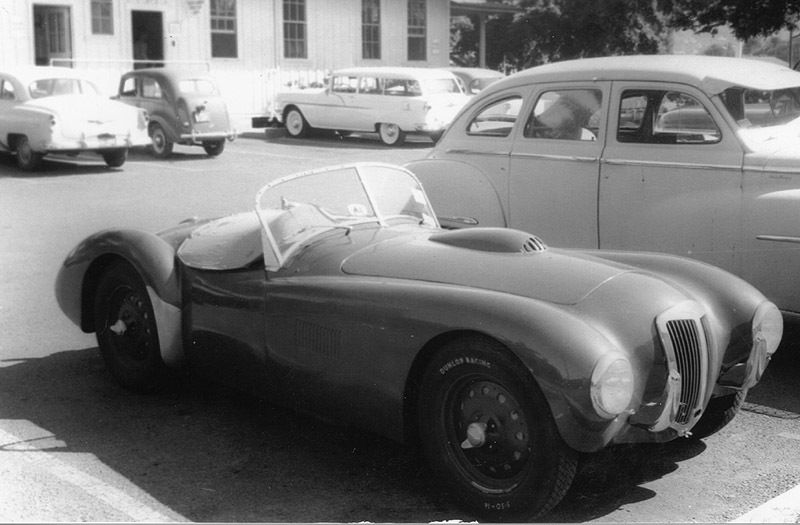 Perry Boswell Sr. ordered a special J2 from Allard. The only ever made. Full front fenders. The rest of the body was a J2. When it arrived in New York, he decided he didn't want it so I bought it. Several years later I sold it to the Battelle Memorial Institute where they wanted to do research of handling, cornering etc. 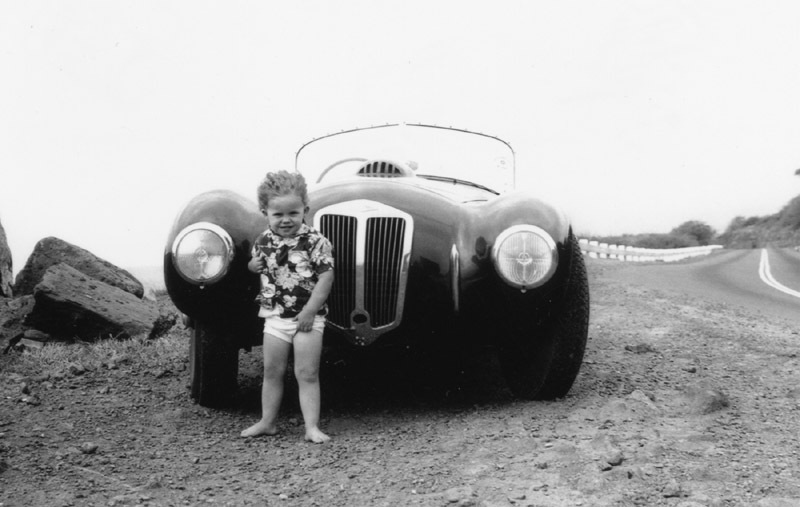 About 8 years ago, I received a letter from a lawyer asking if I had ever owned a J2 Allard. Apparently his client asked him to trace the ownership. He saw a picture of me and a girl friend driving down the main street of Watkins Glen, prior to the race, in about '52. I acknowledged the ownership and got into contact with a Peter.... from around Chicago. He had seen an ad in local newspaper advertising an Allard. He looked at and found it had been under some hay in a barn for 20 years. He was going to restore it and said he would let me know when it was completed. I am still waiting. I don't mind because I enjoyed all the effort I put into the project. I was stationed at Bolling Field from '49 until '52. During that time, I became acquainted with Perry Boswell Sr. and his family from Upper Marlboro, Maryland. 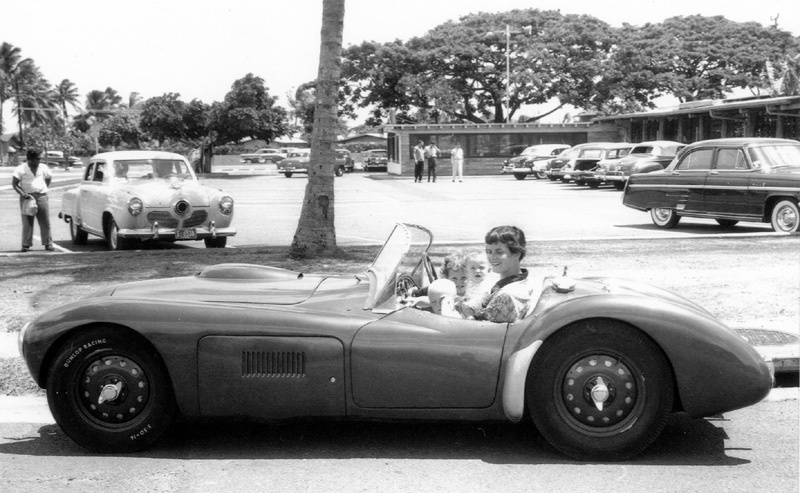 He owned an XK-120 and was an active participant in SCCA (DC) club activities. I was single at the time and spent many weekends at his home, using his garage and tools plus free food now and then. Just too good to be true. That is when I acquired the J2 Allard. In about '54, he entered and raced a Lister MM at Bridgehampton. Up front most of the way until the clutch gave out. In '52, I was assigned to St. Joseph's College, Philadelphia as an ROTC instructor. I traded a Mark 7 Jag sedan for a Nash Healy. Sold it and saw an ad for a Frazer Nash in New York. I made contact with Duke Donaldson and bought the Le Mans Replica. (ex 1952 Sebring winner) I spent the day with him and his wife. During the conversations, he showed me a picture of your Frazer Nash (Mille Miglia 421/100/168). I tried to buy it but he wasn't interested in selling. I drove my car back to Philly and drove it for about a year. It was in terrible shape but I enjoyed working on it. During my tour, Perry relocated to Boca Raton, FL. How he ever found out about the Mille Mille, I'll never know. Anyway, he telephoned me in '54 - Jan or Feb - and asked me to drive from NY to Boca Raton. I agreed and even though the weather was cold, sleet etc., I had a wonderful time driving the car. Returned to Philly and in '55 drove the LeMans to West Palm Beach, where I trained for upgrading in the C97 Boeing Stratocruiser. I spent nearly every week with the Boswell's, using their garage, tools, with free meals. Perry was in the process of removing the windscreen of his Mille Miglia and putting on the V-screen. Much to my dismay, because I liked the way the original screen looked and how pleasant it was to drive from NY. While I was there, he drove my car a lot. His was laid up for the screen work. We finally talked about a trade. He would do it if I replaced the oil pan - it had a crack in it - and get a top-notch paint job. I ordered the pan from England, used his garage and tools and put it on. He selected one of the best painters in Florida and we made the deal. I drove the car to Philly and put it on a boat to Honolulu for my next assignment. Drove daily for about a year. It still had the original rubber that was on it when I drove it to Florida. Decided it was getting small and traded it in on an Aston Martin DB3 hardtop coupe. I checked on the dealer when I flew through Honolulu and learned it had been sold. The name Scott rings a bell, but that was long time ago." 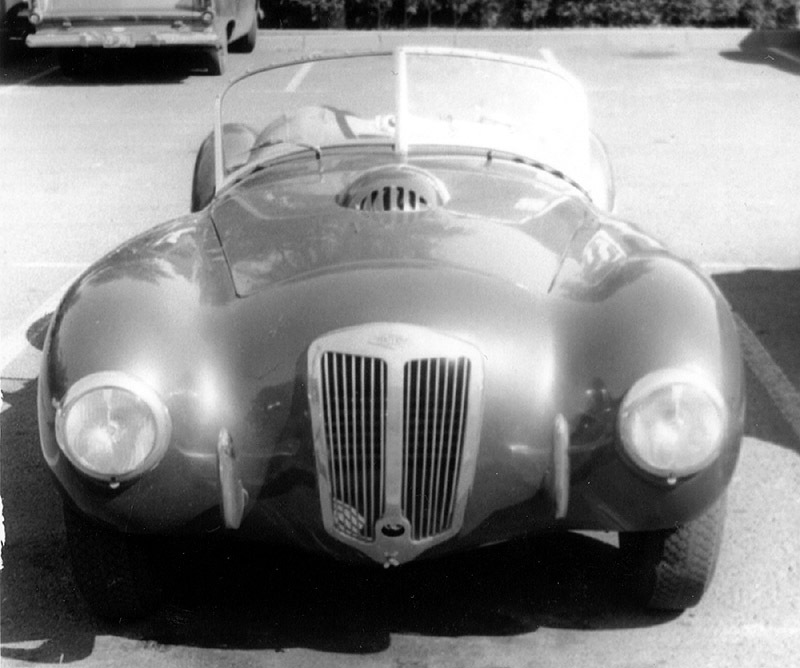 "I was checking through some of the Frazer Nash history on the website and came across the FN that Kulock and Gray drove to a win in Sebring - I think it was in 1952. Anyway, I purchased that car from Duke Donaldson and drove it to Florida, where I attended flight school for the C97 Stratocruiser. I had a new oil pan shipped from England and installed it at Perry Boswell's in Boca Raton. The car had a new paint job and I decided to trade it for Perry's Mille Mille FN - in 1953, I think. I took it with me to Hawaii and traded it for an Aston Martin. I don't know who obtained the FN from Perry Boswell. He is probably deceased, but I know he resided in Stewart for many years. He was well known in SCAA circles for many years. He participated in a National race, out on Long Island driving a Lister MG. I'm passing this on in hope that the next owner can be found."